View More In Table Pads. 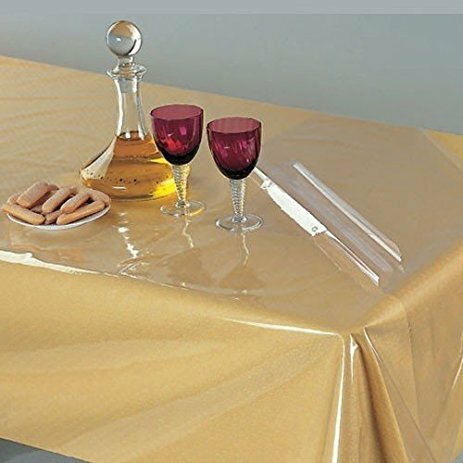 Heavy-duty Exquisite clear plastic tablecloths . Our clear plastic tablecloths are truly clear or see-through, not cloudy or just transparent. Your tables will look elegant with these beautiful clear plastic table covers. Each pack comes with 1 clear plastic waterproof table protector. Features a hemmed border for a nice finished look. Protect your table or tablecloth against scratches, scuffs, stains, spillage while keeping your desk tidy, clean and organized.A clear PVC plastic tablecloth perfect for everyday use. These Crystal Clear reusable tablecloth protectors measure - 90 Inch Round. Easy to clear, using a dish cloth to wipe stains or clean it with water. Protect your table or tablecloth against scratches, scuffs, stains, spillage while keeping your desk tidy, clean and organized. If you have any questions about this product by Home Covers, contact us by completing and submitting the form below. If you are looking for a specif part number, please include it with your message.